Please fill in the following form to apply. Please read the associated notes, below the form, with care, and keep a copy of these when applying. You can also print out this form and send it to us to apply. Note that your place on the course is only reserved upon receipt of the deposit. I have read the Notes on Enrolment, and would like to apply for a place at the Totnes School of Guitarmaking. I enclose, or will send on, a deposit of £850, made payable to "Totnes School of Guitarmaking". Please keep a copy of these notes when applying. In this part of the application form you might simply name the kind, eg "Steel string", "Classical", or "Electric", or you can specify woods, style or other features if you have decided on them. It helps to know in advance, but you will not be held to any decisions, if by the start of the course you have changed your mind. Some instruments may only be made on the course if you are already experienced. This applies mainly to archtops and other exotic guitars. If you are in any doubt, do phone. Each place is allocated on receipt of a completed application and deposit. Confirmation of your place will be sent by return of post. There is a maximum of five students on each course. You will receive information about travel to Totnes, your accommodation and the beginning of the course itself about six weeks before the starting date. A certificate of enrolment can be provided, if needed. On completion of the course, each student will be presented with a Certificate. The finished instrument is the property of the student. The amount to be paid by the beginning of the course is the course fee plus the materials budget. The balance due at the start of the course is this total less the deposit sent with the application. 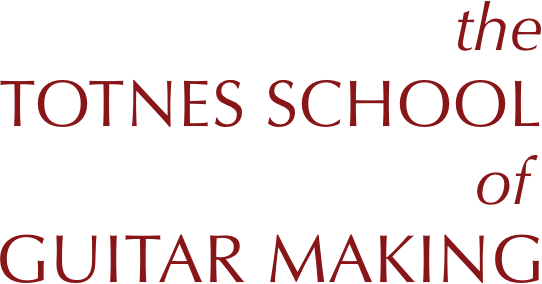 Please make the deposit and balance payable to "Totnes School of Guitarmaking". Payments from overseas students are most easily made by a wire transfer or by using a "Cashiers Cheque", issued in Pounds Sterling and drawn on a London bank. Extra information for students coming from outside Britain includes details of this. Once a place has been confirmed, the deposit cannot be returned. Returning the application form is deemed an acceptance of these terms. A. Lodgings in the house of a friendly local family. A room, all meals except lunch during the week, and bills are all generally included in the weekly price of about £130. There may be a small variation on this as prices are not set by the School; if so, you will be notified as soon as we know. B. Self contained accommodation. There are only one or two agents through whom this kind of arrangement can be made. Though not as easy to find, and more expensive, we can put you in contact with one or two agents. C. Arranging their own accommodation. With friends or relatives in the area.